The Jr. Tyette is just the thing for the brand new dancer. Styled on the same last as our best-selling Mary Jane, the new fit is more generous and more in-tune with today's young feet. The upper material was changed to the new 1mm PU. It's comfortably soft and durable and lined with an absorbent brushed microfiber lining. Also special new features like an Achilles notch for comfort, and an elastic strap connecting the eye-rows for easier tie-ups. Tele Tone® Jr.® taps. These taps are the starting off point for every young dancer eager to learn technique and sound. 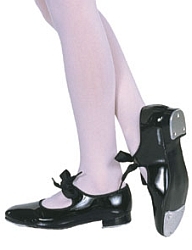 The taps are beautifully contoured to fit the sole and provide a lively tone. The new unit-bottom is flexible and has a slim rubber sole patch that will not interfere with a beginner's technique. Available in adult sizes 3.5-10 in black patent only. Fitting information: Order street shoe size. By special order: wide or narrow sizes and pink, caramel, or white. Please call 1-877-218-1289 for more information.